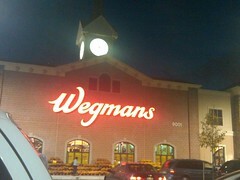 Your Wegmans, Bring it to us. With the Walter Reed Army Medical Center slated to be realigned as part of BRAC, the expansive campus is ripe for redevelopment. This weekend, DC got a peek at what could be coming to that site, and it thrills me to my toes to think that DC might get a Wegmans on that site. The Examiner’s Freeman Klopott and Liz Farmer are reporting that Wegmans and the Mayor and Council are meeting at a retail development conference in Vegas this week. The idea of continuing to shop at Wegmans, and the District getting my sales tax revenue instead of Prince George’s County is pretty exciting to me. Don’t get your hopes up for it anytime soon though. The Wegmans that was announced in winter 2009 for south of Kingstowne hasn’t even broken ground at last check.